There are only seven more home games after tonight, as the Phantoms get ready to host the Crunch in a mid-week affair. The Phantoms began this four-game home-stand with the back-end of a “3-in-3” on Sunday afternoon. They had already lost on Friday and Saturday, but came out with some jump early, at home on Sunday. Alas, they couldn’t solve Penguins hot-shot rookie Murray in goal, and when the Pens snuck a couple by Zepp, the black and gold were happy to take the air out of the puck (?!?) and win ugly. 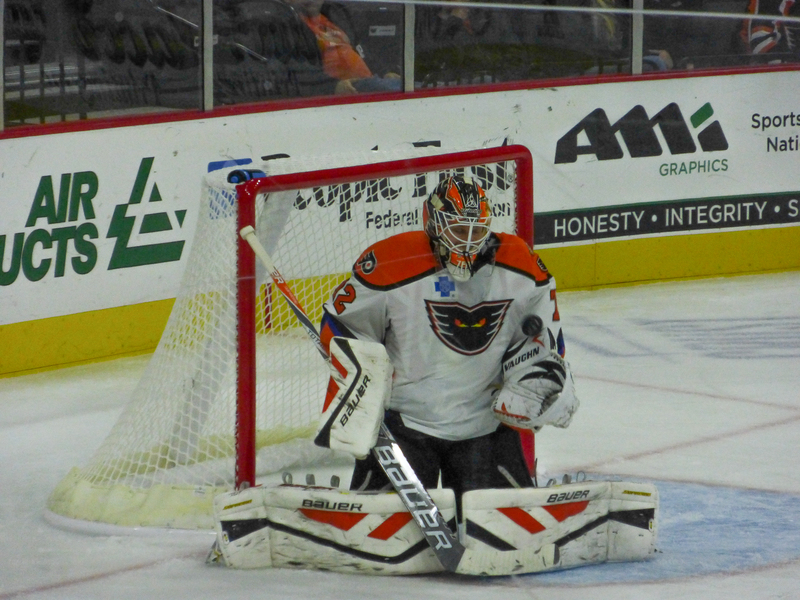 The Phantoms couldn’t get within one, and the Wilkes-Barre/Scranton team added an empty-netter for the 3-0 win. The Phantoms have not been mathematically eliminated yet, but are on life-support for the playoffs. They are 29-27-6-1 and 10 points out of a playoff spot. The team remains fourth in the league in attendance, and with the three mid-week games remaining, I wouldn’t predict a rise to three. The special team–penalty killing and power play–units remain middling in overall ranks, but the penalty-kill has been strong of late. The team has been a bit less sloppy of late, as well, taking fewer of the senseless penalties we saw earlier in the season. Nevertheless, it hasn’t helped with the winning, and goals seem to be allowed in the let-down following the PK in many instances. It is what it is. Blair Jones was a surprise scratch from Sunday’s game due to a suspension. He was suspended for one game due to a hit two nights previous which Coach Murray questioned if it should even be penalized. It was only a minor penalty, so the suspension was quite a surprise when it came down Sunday afternoon. Zach Stortini will not be subject to suspension from an aggressive boarding minor he took Sunday afternoon versus the Penguins’ Farnham. Pens fans have been calling for the suspension, but it may not have been requested by the Pens. You just know Hershey would have requested it. Regardless, the Phantoms and Pens square off several more times before the end of the season, if Farnham (or anyone else) wants a piece of Stortini, they know where to find him. But Cole, do they have a paid, professional fan, throwing out T-Shirts?? Another player practicing with the Phantoms–non-contact for now–is defenceman Matt Konan. He’s been out for quite some time (all this season) from a concussion suffered during the 2013-2014 season. Darroll Powe missed the end of the game on Sunday, and wasn’t available in the locker room after the game or at the jersey auction. There’s been mention that he may have suffered another concussion; he missed time earlier this season from a concussion. We wish him well in recovery, regardless. Shayne Gostisbehere was skating with the team earlier this week as well. I don’t expect to see him back just yet. The Syracuse Crunch are in town for a mid-week tilt. They are a playoff team, in third place and leading their division. They could be a divisional opponent for us next year, as Norfolk will be leaving our division. The Crunch are the AHL affiliate of the Tampa Bay Lightning. Game Time: 7:05PM Puck Drop. Doors Open: 6:00PM I believe there’s a “job fair” kind of thing for those interested in a career in professional sports. If I recall, for 3-5PM or so, and you might need your game ticket to get in. Check it out if you’re interested in a job with the Phantoms, IronPigs, SteelHawks, or others. Pre-Game: I recommend arriving by 5:15PM if you’d like to secure a seat at Chickie’s and Pete’s for a pre-game meal–5:30 for BrewWorks. Tickets: Good seats are still available for this game. The VIP package is available for this game, at press time. Promotion: Coors Light Happy Hour. Coors Light drafts are available for $2 at the Coors Light Bar behind section 108, and perhaps behind section 119 as well. 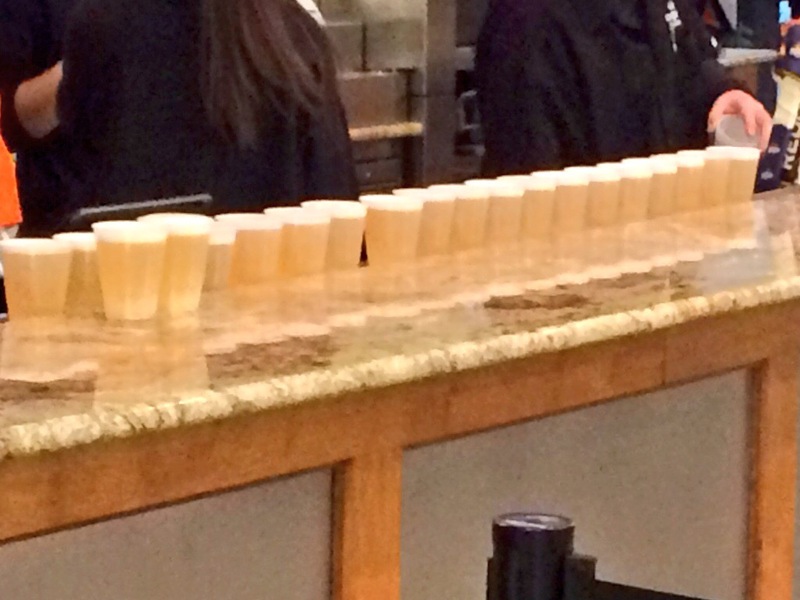 The little cups of watery beer will return to full price at the start of the second period. Watch to see if we can get a darn win. Never mind. I’ll settle for getting a GOAL! Watch to see who starts in net. I love Rob Zepp, but he had a clean look at both goals scored on him in Sunday’s game. I’m not saying it’s Nobody’s Fault But His, but we’ll see if this is the point in the season where the prospect Stolarz gets more ice time. Watch to see if newcomer Nick Luukko gets skates for the game. Whispers are, he needs more practice time. Watch to see if high-energy guy Bardreau shows a little more pep now that he’s had two days to rest. 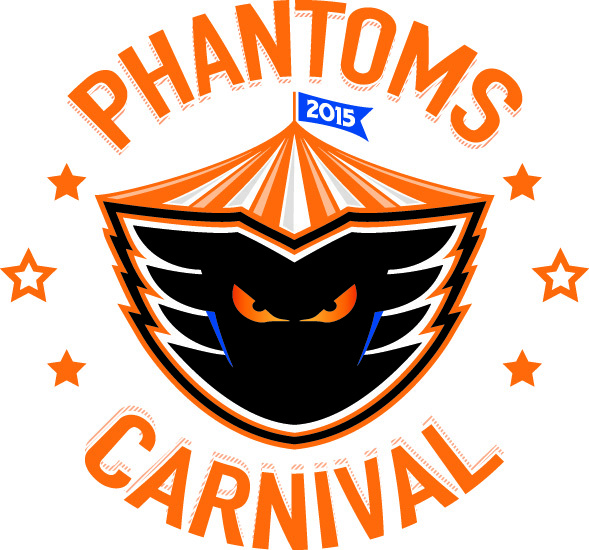 The 2015 Phantoms Carnival is Friday night at the PPL Center. Full season ticket holders for the 2015-2016 season should have received tickets via email for this event which will last from 5:00PM to 9:00PM. Tickets are not for sale. Details are sketchy, but players will be available for pictures and autographs. If you are a full season ticket holder who has not received tickets (via email, Monday afternoon or early evening) please call the Phantoms ticket reps. The email in question will have one attachment which will include one ticket for every seat in your season ticket account. The Phantoms are home for the weekend–Saturday and Sunday–with games against the Pens (again) and Monarchs, respectively. Saturday is “Faith Night” with a post-game concert. The Sunday game is at 3:05PM, and will feature a post-game “skate with the players” event. The University of Minnesota spells out the state’s name each and every time their school scores a goal no matter what the circumstances of the game are : “M-I-N-N-E-S-O-T-A, Minnesota, Minnesota, yay Minnesota!” … Having lived in Minneapolis for four years (on top of having seen many Golden Gophers games in several different decades), I can personally attest that that cheer is a very unique one that never seems to get old. No, college hockey teams certainly don’t pay Professional Super Fan types $ 10,000 per game to obstruct spectators’ views. Jimmy T and BFF will be in the house tonight!! Ich komme heute Abend und bringe 18 Freunde mit mir. Hoffentlich, die Phantome koennen ein paar Tore treffen. Angriff haben zu viele Sand in das Getriebe den letzten paar Spiele.